For a number of years I have been into Boxing and Mixed martial arts (MMA). In fact the first pair of gloves I ever got was Jeet Kune Do gloves/Kempo gloves. They were gloves very similar to the gloves used by Bruce Lee in the movie "Enter The Dragon". They were made out of high quality leather and canvas. They had a thumb and broken knuckle design allowing grappling. Now that was prior to the The Ultimate Fighting Championship era in the 90s. So things like 7oz Everlast Evergel MMA Gloves had not yet come to market. The Jeet Kune Do glove wrist guard had a lace-up closure for a secure fit. There is a certain kind of fit that you can get from a lace up glove that you just can’t get from a velcro glove. However I hated having to ask someone to lace me up all the time. I tried switching the laces out for elastic laces, but it did not feel quite the same. Soon I went on to switch to all Velcro (Hook & Loop) Gloves. Lace-Up Gloves VS. Velcro Gloves. 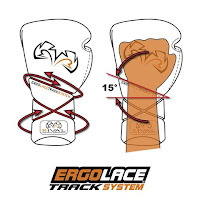 Lace-up Boxing Gloves have laces just like your shoes allowing a more customizable fit. Where as Velcro gloves are fixed to fit. The Velcro (Hook & Loop) would sometimes scratch people I was training with because the straps would sometimes be too long and left my velcro exposed. Plus Cheap Velcro will lose effectiveness over time and lose grip. Last but not lease Velcro (Hook & Loop) Gloves usually have less padding around the wrist. Velcro gloves are really easy to put on. More and more people like myself train alone these days, so being able to put on my own was a must. They work well with my short training sessions, allowing me to take them off and put them back on again in seconds. In recent years I have gone back to lace up because generally I get better wrist support. I ordered a pair of Rival High Performance Hook-and-Loop (velcro) Sparring Gloves (RS2V) but the wrist support was just too loose for me. I also didn’t like how difficult it was to strap and unstrap. Just like with lace gloves, I was going to have to keep asking or bothering people to help me get my gloves on or off. I sent them back and got the 16oz Rival High Performance Lace-up Pro Sparring Gloves (Rival RS1). 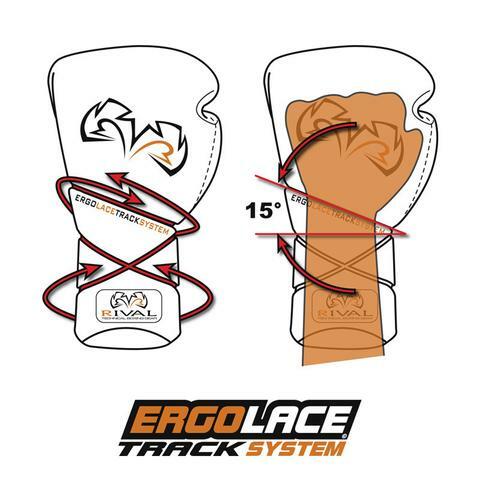 Theses Sparring Gloves had what Rival called the Ergolace Track System. It had a 15 degree angled "Lace Track" at wrist for anatomical fit and the "X-Lace Track" on cuff for perfect lacing every time. However I still needed to have someone lace me up. So I was unable to use them when I worked out alone. They make lace converters. A Hook & Loop Glove Converter is a velcro strap that converts the laced gloves to a velcro (Hook & Loop Glove) glove. There's really only a few options for lace converters, TITLE makes one, but they did not have enough tension and it was hard to wrap with my gloved hand. Plus I was unable to really use the X-Lace Track for the laces on the cuff. Someone loaned me a pair of the Lace N Loop glove enhancing system. I used them on my Rival RS1 gloves and they worked flawless. This product makes any lace up glove quickly and easily into a convenient elastic wrist cover strap. 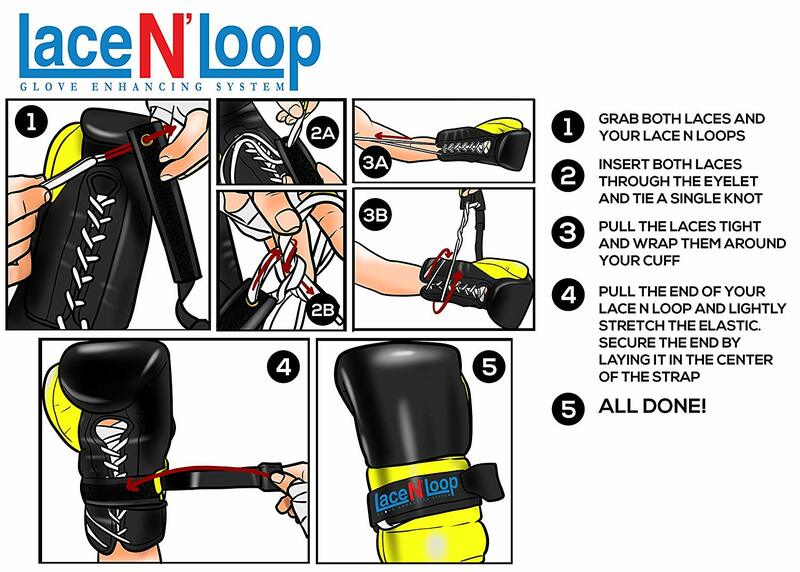 It converts training, pro-fight and competition glove laces into hook-and-loop attachments. All you have do attach your laces to the strap. On the other side, the strap is extended with an elasticated section which connects to the hard velcro side. Then you wrap the Lace and Loop around your gloves. The thin elastic bands made my gloves fit snug on my wrists. A hook-and-loop closure keeps the glove secure to wrist and hand.They are easy to install and put on/remove, even with a gloved hand. The Strap itself is about an inch wide and soft velcro on one side and a foam-like texture on the other side will hold onto your gloves without damaging them. I bought a pair of The Society Nine Lace and Loops which worked the same way. Like the Lace N Loop glove enhancing system, you tie a knot through the eyelet of the Society Nine Lace and Loop. Then place your hand in your glove, tighten the laces, and just wrap the Society Nine Lace and Loop around your gloves. When you first use the Lace N Loop or The Society Nine Lace and Loops putting on the second glove might be tricky the first few times you use them by yourself. Putting the first glove on is always going to be a little easier.The small straps may be hard to grip with gloves on at first. However its a technique everyone will learn fast and the fabric tab on the end was easy to grab a hold of with gloves on. I can use both converters to put gloves nearly as fast as the hook n loop style gloves. 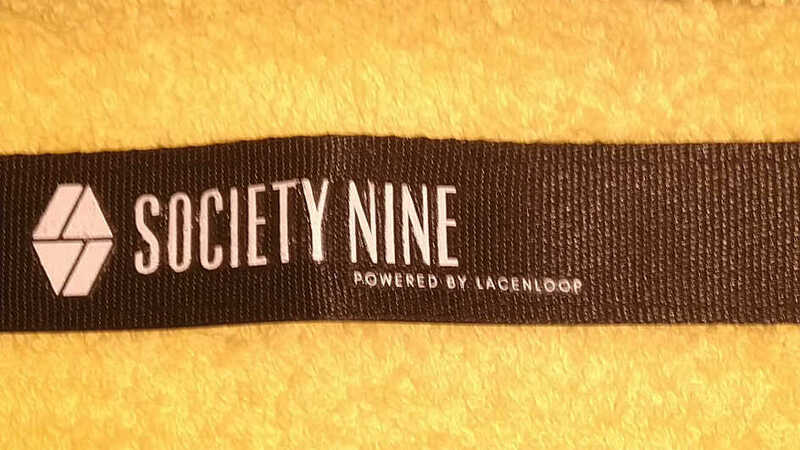 Society Nine Lace and Loops came very fast, one day earlier than planned. They included a letter and a sticker thanking me for my support. I would definitely recommend this company to any woman looking for WSD (Women Specific Design) boxing gloves. 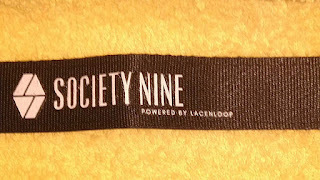 Both Lace N Loop and Society Nine Lace and Loops converters work differently. 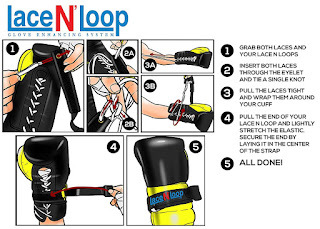 Instead of them trying to mimic velcro gloves like TITLE Hook & Loop Glove Converter, they work with the laces, allowing you to get the full benefits of any lace-up glove while still being able to put the gloves on by yourself.I have done bag and pad work. I done some sparring and the velcro straps held strong and never came undone. Lace up gloves are secured with a single lace crossing both sides, which are pulled tight and tied around the hand. The wrists will feel more streamlined and less bulky compared to Velcro gloves. I definitely recommend both products if your looking for a solo glove lacing system.